/etc/logrotate.conf file contains default settings and includes statement to pull in configuration files from /etc/logrotate.d directory. /etc/logrotate.d/ directory contains the configuration files saved by various applications and utilities. Nothing existing files inside /etc/logrotate.d/ should be altered without knowing about that particular software. For the most daemon processes, logs would be rotated by the root user. logrotate usually invoked from a script in the /etc/cron.daily/ directory. We can run logrotate as a cronjob to ensure that logs will be rotated as configured. If we configure logrotate to rotate logs every day, but logrotate actually runs every week, the logs will only be rotated every week. You need demystification of those phrases. missingok: Missing OK. If no log files are found, don’t debug or print error. delaycompress: Delays compression until 2nd time rotating. compresscmd: Set which command to used to compress. Defaults to gzip. uncompresscmd: Set the command to use to uncompress. Defaults to gunzip. postrotate: Scripts to run after rotating is done. size=10M : command sets the minimum size for the rotation to take place to 10M. dateformat: The format of the date appended to the log filename you want. This Article Has Been Shared 6529 Times! Here is a Guide on Possibilities of Using Text Based User Interface (TUI) on SSH Environment. Number of Programs Currently is Few in Number. Cloud Computing Jobs is Facing Deficit Skilled Candidates. Some Companies Having Difficulties to Get Candidates with Sufficient Knowledge. Here is How To Setup Nginx WordPress to Redirect to Geographically Closer Server. This is Called Geo Redundant Setup, Not Very Difficult. Here is How To Configure Nginx Access Log With GeoIP on Ubuntu 16.04. Usage Commands Also Shown. Access Log is Powerful & Configurable Tool. 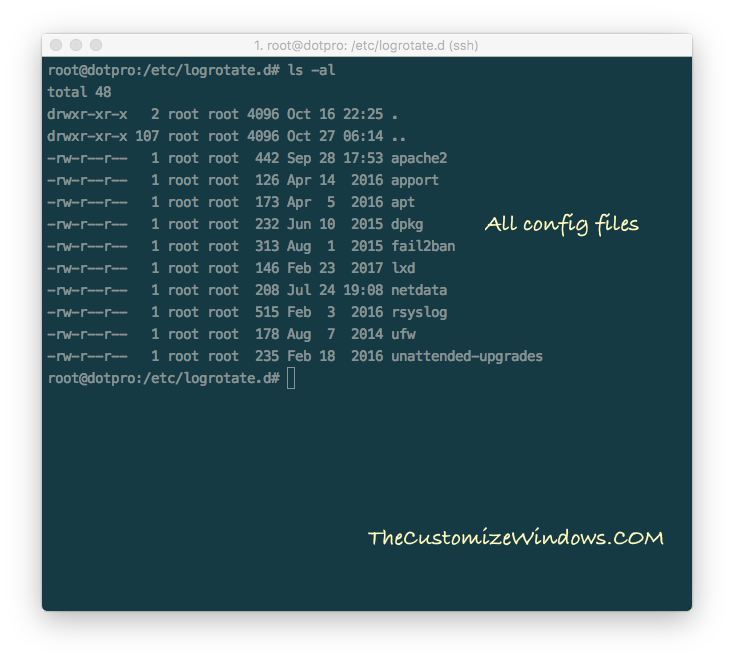 Cite this article as: Abhishek Ghosh, "How to Manage Logfiles with Logrotate," in The Customize Windows, November 12, 2017, April 21, 2019, https://thecustomizewindows.com/2017/11/manage-logfiles-with-logrotate/.